That leaves six players to fill just three spots. Those players are Brandon Pirri, Tomas Nosek, Ryan Reaves, Ryan Carpenter, William Carrier, and Valentin Zykov. To me, because there are two slots open on one line and only one on the other, the focus should be on creating the best fourth line possible and then using the leftover player to fill out what already should be a promising line of Eakin and Tuch. Because the Golden Knights prefer to roster a fairly standard fourth line (meaning it’s much more of a checking/possession/don’t give up goals line) Pirri and Zykov aren’t great fits. They’ll come back into play when we consider the final piece on the third line. Rather than give my opinion on how it should line up, I’d rather use numbers. So, using NaturalStatTrick.com’s “Line Tool,” I’ve gone through each potential option to see how they’ve performed as a trio when together. On December 29th the Golden Knights claimed Valentin Zykov on waivers from the Edmonton Oilers. First Zykov got held up by immigration, then it took four games before he finally got in the lineup. He was scratched the next five games before finding himself back in the lineup. Zykov eventually found himself on the Golden Knights top line playing with Jonathan Marchessault and William Karlsson. That lasted three games before he was demoted to the third line for a game and eventually out of the lineup. He’s been a healthy scratch since February 12th, missing 13 straight games. Today, in his daily press conference, I asked Gerard Gallant about if he has been considering putting Zykov back into the lineup. His answer was telling. Earlier in the year, Gallant mentioned how he didn’t like how long he kept Oscar Lindberg, Brad Hunt, and Jon Merrill out of the lineup. However, it doesn’t seem like Zykov will be getting the same treatment. Instead, he may find himself in the roster in the final few games after the playoffs are locked up, but Gallant isn’t ready to start thinking about that. The question now becomes did Zykov do enough to find his way into the mix next year. The Golden Knights forward group is going to be a crowded one in 2019-2020, but Zykov makes just $675,000 and Vegas is likely to be pushing the cap. He’ll have a full training camp under his belt, plus half a season practicing with the NHL club, but it wouldn’t be shocking if we’ve already seen the end of Valentin Zykov in meaningful action as a Golden Knight. In somewhat of a surprising move, Gerard Gallant moved Valentin Zykov up to the first line to play with William Karlsson and Jonathan Marchessault. Zykov has been waived as many times as he’d played in a Golden Knights uniform, yet there he was playing on a line that was considered one of the best in the NHL a year ago and the decision wasn’t forced by injury. In the game against Florida, he was on the ice for a career-high 17:32, recorded three shots, created multiple scoring chances, and registered three hits. He was also a -1, had three giveaways, and posted a 50% Corsi For. The Golden Knights did not score with Zykov on the ice. Yet, here we are, heading into a Tuesday night game against the best team in the NHL, the Tampa Bay Lightning, mired in a four-game losing streak, and Gallant has once again put Zykov back on the line with Karlsson and Marchessault. Having watched the game live I remember thinking Zykov had a few good chances, helped create a few others, but overall was far from memorable in the game. But when I saw him back on that line in practice and I figured I must have missed something. He must have done well enough to keep the spot. So, I went back and watched all 16 shifts Zykov took and not only do I agree with Gallant, but I thought he was the best player on the line… by far. Of the 16 shifts, I counted 12 that I would consider him having a positive impact, with four of those 12 being majorly positive. Karlsson’s positive shift number was eight, Marchessault’s was five in the same 16 shifts. Both of those instantly opened up the ice for William Karlsson. Nothing came of either, but these type of quick accurate plays are what the Golden Knights do when they are at their best. It wasn’t just off the walls either. Here’s a terrific pass through the neutral zone to spring a break and eventually lead to two of his three shots. Almost every shift he made a pass that advanced the puck quickly. Unfortunately, most of the time Karlsson and Marchessault were unable to do much with it. Here are a couple more examples of that. The average age of the Golden Knights current active roster is 28. If you weight it by time on ice that number jumps to 29, the 3rd highest in the league, tied with San Jose and Los Angeles. The team has eight players that are at least 30 and another nine that are 27 or 28. 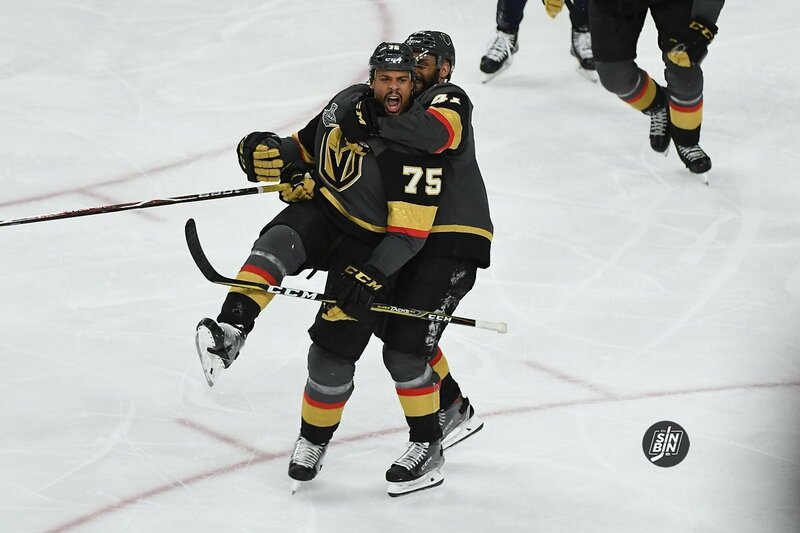 There are only three guys under the age of 24 that have seen the ice for the Golden Knights in 2018-19 with Alex Tuch being the youngest at 22. That distribution is a massive reason why Valentin Zykov was not only claimed by the Golden Knights, but also why other arrangements (Brandon Pirri to AHL) were made to allow him to stick around. Well before the season began (on 07/24/18) we took a look at the entire Golden Knights system, including draft picks, free agent signings, and the Pacioretty trade and identified this age gap. Since then, things have only gotten worse as the Pacioretty for Tatar and Suzuki trade made the Golden Knights older, Pirri has been the only call-up to have an impact (he turns 28 in April), and young guys like Reid Duke, Tomas Hyka, Jake Bischoff, Zach Whitecloud, Dylan Coghlan, and others haven’t had an impact. What Should/Will The Golden Knights Do With Brandon Pirri And Their Roster Crunch In The Coming Weeks? 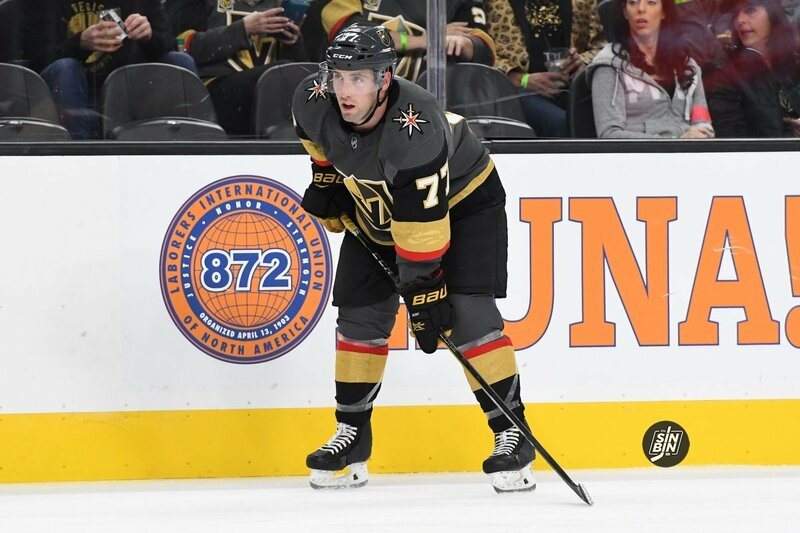 The emergence of scoring wizard Brandon Pirri, coupled with injuries to Colin Miller and Max Pacioretty, and the waiver claim of Valentin Zykov has left the Golden Knights in a roster pickle, with 25 players and only 23 available spots. 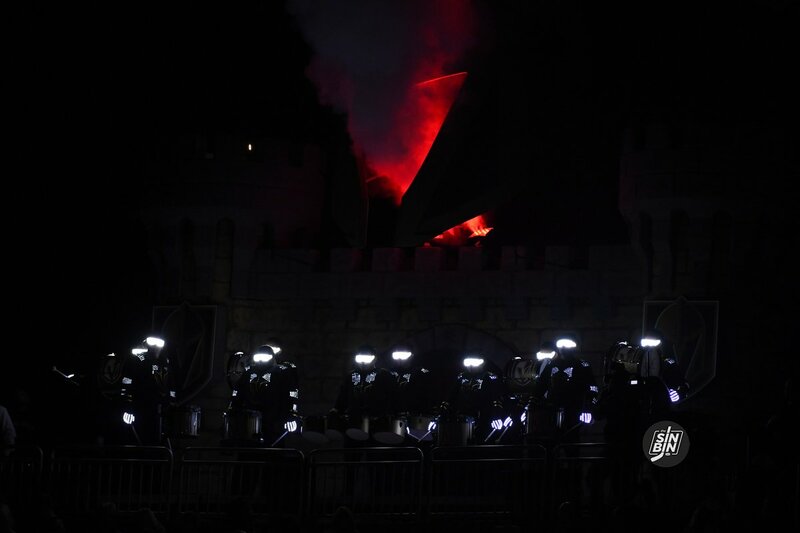 There are a few questions on just about every Golden Knights fan’s mind and we’ll attempt to answer every single one in this article. Read on. As of this moment, the Golden Knights roster stands at 23 with Colin Miller and Max Pacioretty on IR. Pacioretty skated with the team in practice yesterday, is expected to do so again, and will likely play either tomorrow or Sunday. Miller skated before practice yesterday, will likely do so again today, and shouldn’t be much more than a week or so away from making his return to the Golden Knights lineup. Valentin Zykov was claimed on waivers from the Edmonton Oilers on Saturday. Per NHL rules, if the Golden Knights want to keep Zykov, he must remain on the NHL roster for the remainder of the season. 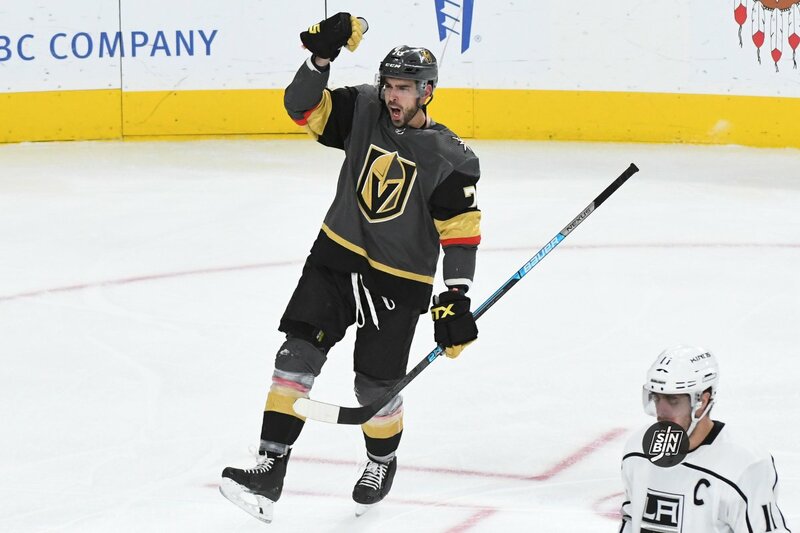 Brandon Pirri has scored six goals in seven games with the Golden Knights and has played on the 2nd line with Alex Tuch and Paul Stastny in all seven games. Per NHL rules, Pirri is allowed to be sent back to the AHL without clearing waivers if he does not play in 10 games OR is on the active roster for fewer than 30 days. Thus, if he plays three more games or is on the roster for another 15 days, he would have to once again clear waivers to be sent back to the AHL. 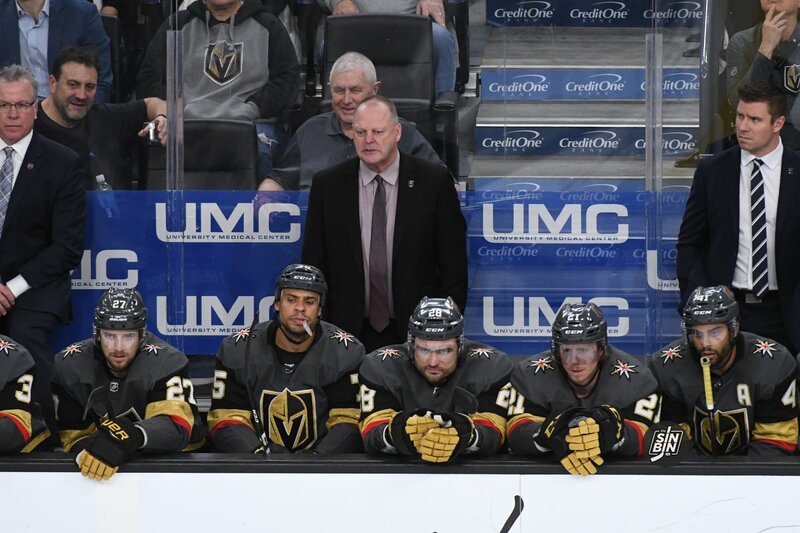 Through 43 games, Oscar Lindberg, Ryan Carpenter, Tomas Nosek, Pierre-Edouard-Bellemare, Max Pacioretty and Ryan Reaves are the only forwards on the roster to have been scratched by Gerard Gallant without being on IR. Reaves, Pacioretty, and Bellemare were each scratched once and they all are believed to be injury or family/medical related. Carpenter has been scratched three times, Nosek has been scratched four times, and Lindberg has been scratched 23 times. However, in the past six games that Gallant has had to choose two of those three, he has scratched each one of them two times. The most recent player to be scratched was Nosek. I was specifically warned against doing this, but what’s the point of the Internet if not to do things people tell you not to and make them angry (Sorry, I’m not sorry Turk). Let’s start with Zykov as he’s the biggest unknown of all of this. The Golden Knights could instantly clear one spot on their roster by immediately putting Zykov back on waivers. That would allow either Pacioretty or Miller to come off IR and the roster remain at 23. 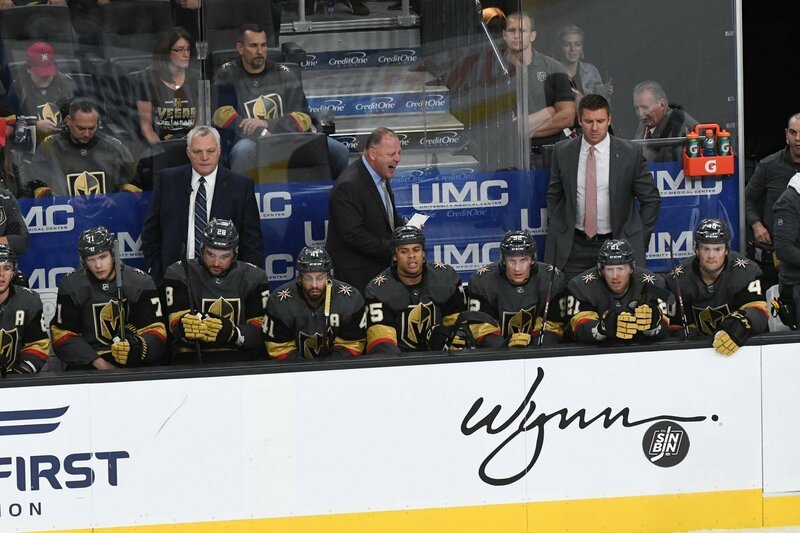 However, Gallant made a comment in a recent press conference that he started watching film on Zykov “the first time he went on waivers” which indicates that Vegas may have wanted him originally. They did not have priority so he went to Edmonton, then when he hit waivers again, Vegas claimed him and got him. Thus, it makes sense that this is not a short-term rental that won’t be given a chance, but instead that McPhee/Gallant see something they like and they want to give him a shot. He’s expected to finally make it into the country today after having some immigration issues. He’ll probably practice a few times with the team before getting in a game, but if he remains on the roster when Pacioretty comes back, it should be expected that he gets at least some game action with the Golden Knights. So, let’s say we expect him to stay, at least for a little while. When Pacioretty comes off IR someone is going to have to be taken off the roster to comply to the 23 man limit. The easiest option would be for another injured player to be placed on IR. At the moment, the Golden Knights do not have any other players we believe to be injured. In January of last season, when VGK was in a similar bind, Jon Merrill was placed on IR with what was described as an “undisclosed injury,” to make room for Luca Sbisa who came off IR. Clearly, it is against the rules to declare a player that is not injured, injured, however, don’t be completely stunned if there’s a surprise injury that we were unaware of that leads to an IR stint which opens a roster spot for Pacioretty. If that were not to happen, then McPhee would have to choose one player to be sent back to Chicago. The most likely options are the three forwards previously mentioned (Carpenter, Lindberg, or Nosek), one of the commonly scratched defensemen (Merrill or Hunt) or Brandon Pirri. Before we move on, let’s address Pirri. Can you really send Pirri back to the AHL? The short answer is yes, they absolutely can, and the reason is not that he’s not good enough to be on this team. The main reason is that if he doesn’t hit that 10th game, he’s the only guy on the roster (aside from Tuch and we know that’s not happening) that can go to the AHL without risk of being lost on waivers. Zykov has played with the Edmonton Oilers and the Carolina Hurricanes this season. He’s scored 4 goals and tallied 7 assists (all with the Hurricanes) in 30 games this season. Zykov was placed on waivers by the Hurricanes on November 30th by the Hurricanes, he was claimed by the Oilers. Yesterday the Oilers waived him, and VGK put in a claim. Zykov played for the Hurricanes in Vegas on 11/3. He took just 9 shifts for a total of 4:41 of ice time. Zykov scored 33 goals and had 54 points in 63 games in the AHL last season for the Charlotte Checkers. Zykov is signed through next season at $675,000 AAV.